Devialet's new Phantom wireless speaker boasts 60 per cent more power | What Hi-Fi? Devialet has launched a more powerful and more affordable version of its Phantom wireless speaker. It also comes bundled with a 'Treepod'. The new Devialet Phantom outputs 1200W of power, compared to the original's 750W. It features the French manufacturer’s new-generation ADH2 technology and, priced £1290, is £100 cheaper than the original. The new Phantom sits below the 3000W Silver Phantom (£1690) and 4500W Gold Phantom (£2190) in Devialet's range. The upped power output comes via an Elevate software update, which owners of the original Phantom can also receive. However, they won’t be able to benefit from the improved ADH2 technology, which is hardware-related. 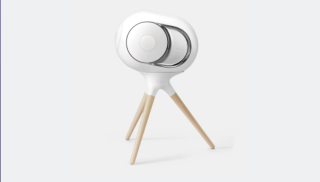 If you'd like your Phantom perched on a tripod (or what Devialet calls a ‘Treepod’), you can choose the company’s ‘limited offer’, which bundles both together for £1390. Don't forget Black Friday is just around the corner. You can keep track of all the best deals on our Best Black Friday deals page.